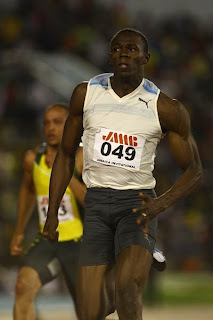 KINGSTON, Jamaica (CMC) - Usain Bolt will contest seven races in the new IAAF Diamond League next year. Glen Mills, coach of the superstar sprinter from Jamaica, has indicated that Bolt will make an assault on the new series of races which will replace the current IAAF Golden League, which has been staged annually throughout Europe for the past 12 years. "The Diamond League is our major project next year, in which he'll be running seven races between the 100 and 200 metres - that's what we are going to be focusing on," Mills told the TrackAlerts website. "Competing in the Diamond League is our number one priority. We'll then see how the rest of the season develops, and we'll take it from there." With no major international meets on the cards, except maybe the Commonwealth Games, Bolt and his camp are eyeing the lucrative Diamond League. The series will commence from 2010 and aims to enhance the worldwide appeal of track & field by going outside of Europe for the first time with major meets. Glen Mills, coach of the superstar sprinter from Jamaica, has indicated that Bolt will make an assault on the new series of races which will replace the current IAAF Golden League, which has been staged annually throughout Europe for the past 12 years. "The Diamond League is our major project next year, in which he'll be running seven races between the 100 and 200 metres - that's what we are going to be focusing on," Mills told the TrackAlerts website. In addition to the current Golden League venues and other traditional European meetings, the Diamond League will include events in the United States, China and Qatar. The Qatar meet at the Khalifa International Stadium opens the League on May 14 in Doha, and the Shanghai Golden Grand Prix follows nine days later at the Shanghai Stadium in that Chinese city. In the United States the two meets are the Reebok Grand Prix which will be held on June 19 at the Ichan Stadium in New York City, and the Prefontaine Classic, which will be staged on July 3 at the Hayward Field in Eugene, Oregon. The other 10 meets are all being staged in European cities - Oslo, Rome, Lausanne, Gateshead, Saint-Denis, Monaco, Stockholm, London, Zurich and Brussels, which holds the last meet on August 27.